In The Mediated Construction of Reality, Nick Couldry and Andreas Hepp shed light on how media, and social media in particular, has come to transform our personal and social lives. While suggesting that a less theoretically dense discussion might have been more accessible for readers, Ignas Kalpokas nonetheless anticipates the book will prove a highly influential contribution to understandings of the media today. The Mediated Construction of Reality. Nick Couldry and Andreas Hepp. Polity. 2017. 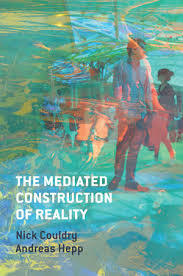 There can be little doubt that in terms of its contribution to media studies, Nick Couldry and Andreas Hepp’s The Mediated Construction of Reality will prove to be a hugely influential book, largely delivering on the praise on its back cover. It updates our understanding of how the media affects our extensions in space, time and thought while itself becoming increasing interconnected internally i.e. across different types of media. And yet, all this innovation is in danger of being obscured as the authors somewhat overindulge themselves in theoretical discussion that does not necessarily contribute to the development of the overall argument. As a result, it is impossible to review this book without a degree of ambivalence. The authors adopt a media-centred approach rather than, to quote an earlier article by Hepp and others, a media-centric one. While the latter would assume contemporary media to be a univocal cause of the change, Couldry and Hepp see it as instead placed at the centre of today’s institutions and activities, fuelling social and political transformations through an interplay of our use and consumption practices and the media’s own internal logic. Here, Couldry and Hepp demonstrate a talent for picking up on something that we may grasp intuitively from our own daily experience and taking it to the next level. In particular, they unify all those disparate experiences under one conceptual framework – ‘deep mediatization’ – which, in the broadest sense, refers to the dependence of institutions on the media to the extent that their basic functions can now only be effectively carried out through it. So, to this degree, The Mediated Construction of Reality is an immensely practical book: it sheds light on how the profusion of media, and social media especially, has transformed our personal and social lives. The book’s ambition is anything but modest. Even a cursory glance at its contents reveals the breadth of its aims. First, the authors set out to rethink social constructivism in light of the media’s ever-growing role in everyday life. That would be a worthy goal for an entire academic volume, but here it is just the opening of the book. The authors’ chief contribution in this part is their development of ‘materialist phenomenology’ and its application to media studies by revisiting and updating some of the canons of the genre. Next, they remodel conventional conceptions of space and time, while also supplementing them with a third dimension, data, which is by now more or less de rigueur when discussing anything online-related. This is where the substantial contribution of the book begins and the reader really gets rewarded for their patience, particularly in the authors’ discussion of the ‘new infrastructure of social knowledge’ (128), which manifests itself in the extension of information and social interactions across time and space into the singular ever-presence of ‘big data’ that alters processes of social change and agency within them. The third part of the book is dedicated to agency under three different guises: the self, collectivities and order. Couldry and Hepp’s analysis of the first two is a success: even though discussions of how selfhood, human relationships and collective bodies have been transformed by today’s media are aplenty (perhaps to the extent of becoming banal), the authors tease out insightful ideas about the situatedness and constitution of our everyday existence. The basic argument here is that the world has become a network of inescapable interdependencies, with examples that range from economic subjugation and political emancipation via contemporary media technologies illustrating the manifold context-dependent nature of today’s mediatised world. It is only the chapter on order that fails to end the book on a high note by being overly generic and failing to address the implications that ‘deep mediatization’ is likely to have on politics in detail. The authors could be criticised for occasionally sliding into some sort of prophetic tone of ‘we have this New Big Thing that explains everything’. Indeed, despite the mostly explicatory aim of this book, emphasis on the ‘so what?’ question could have featured more prominently. This would not only broaden the book’s appeal but also allow the authors to themselves identify the problems surrounding deep mediatisation, the transformation of social knowledge and the fundamental interconnectedness of human agency instead of just describing them. And that only serves to demonstrate that even the most ambitious of books can occasionally lack ambition in certain respects. Perhaps the main criticism that could be raised is that, despite the apparently practical core outlined above, the book is particularly heavy on theory, to the extent that at times it is impossible to be sure of Couldry and Hepp’s overall aim. Do they intend to construct a framework for understanding today’s mediated world, a more straightforward down-to-earth exploration of this world, a hermetic discussion with other authors or maybe something completely different altogether? A reader could easily feel confused. Hence, an important caveat is that the book necessitates a specific type of reader: one who, although not necessarily trained in all the theoretical approaches entertained in this book, still has a general grasp of social and communications theory and the patience for deciphering a dense theoretical discussion (even though the authors are rather good at explicating what it is that they are doing). Hence, although the breadth of the authors’ knowledge and their ability to synthesise such a broad corpus of work are outstanding, a more streamlined version of this text would be just as illuminating but immensely more accessible. Overall, this is certainly far from a leisurely read. But, despite this reviewer’s ambivalent stance towards Couldry and Hepp’s writing style, for those with the determination and patience to unpack it, The Mediated Construction of Reality offers important insights into the mutual interdependence of the media and our everyday social world, the global interconnectedness that is leading to the redistribution of knowledge and agency and new ways of collective existence. Moreover, the authors’ foray into materialist phenomenology unlocks a potentially interesting methodological approach. It is only the lack of a specific audience focus that leaves one at times disappointed. Ignas Kalpokas is currently assistant professor at LCC International University and lecturer at Vytautas Magnus University (Lithuania). He received his PhD from the University of Nottingham. Ignas’ research and teaching covers the areas of international relations and international political theory, primarily with respect to sovereignty and globalisation of norms, identity and formation of political communities, political use of social media, political impact of digital innovations, and information warfare. He is the author of Creativity and Limitation in Political Communities: Spinoza, Schmitt and Ordering (Routledge, 2018).